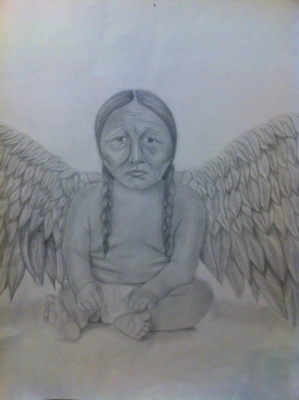 Through this drawing, I am trying to portray the idea that we as aboriginal people still continue to live with the effects of residential school. As many of us know, several aboriginal children were forced to live and grow up in residential schools, where a lot of the children suffered many forms of abuse, along with the loss of family, culture and parenting skills. The body of the child represents the youth and the clean slate that we bring into this world, into our culture, and families. The body of the youth gives us hope for brighter days ahead, as well as symbolizing the need to be nurtured, protected and loved. The head of the aboriginal Elder symbolizes the burdens of our past. I tried to incorporate the emotion of hurt and brokenness that he feels onto his face. I felt as if he was violated in mind, body and spirit and he continues to see the broken spirits in our communities. The wings, for me, symbolize that we still have the power to rise above all damage we have endured. And, that if we continue to help each other, to help ourselves we will one day “Soar again”. I feel that my drawing comes together and the message that I am trying to send is being achieved.